It’s Thanksgiving week. Before I (and probably most of you) take a few days off for family, football and perhaps some shopping I wanted to take a moment to list some of the things for which I am personally thankful. As an artist, musician and art administrator I get the privilege of working with a broad creative community in Minnesota. As artists it’s easy to dwell on the negative, the lost grant, the rejection letter and all the challenges and hardships of this career path. Those unfulfilled aspirations aside, Minnesota is a pretty nice place to live and work as an artist. So for my Thanksgiving reflection I submit thirty things I am thankful for as a Minnesota artist. The fear with any list like this is that I will miss something … so please add your personal additions to my list in the comments section. So here we go … in no specific order. 1. Community: I am thankful to be part of a welcoming, vibrant and supportive artists community. This resource cannot be underestimated and will continue to keep many of us here and attract others. 2. Institutions: For world class institutions like the Walker Art Center, Guthrie and MIA. We shouldn’t take you for granted. 3. The Minneapolis Sculpture Garden: I drive by it every day and don’t take advantage of it enough. I am reminded every time I see Spoonbridge and Cherry how public sculpture can become an icon for a whole city. 4. 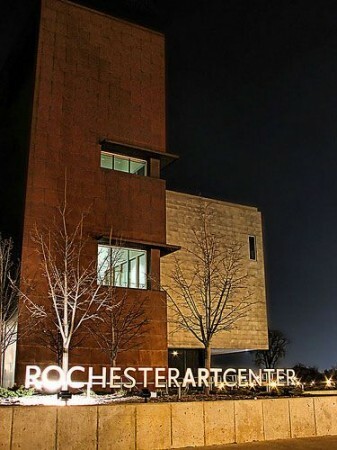 The Rochester Art Center: Quietly building a reputation for cutting edge exhibitions and public programs, the RAC has premiered work by established international artists (Inigo Manglano-Ovalle, Roman Signer, Tony Tassett and upcoming Miguel Calderón) to its ongoing showcase of the regions finest mid-career and emerging artists (Bruce Tapola, Chris Larson, David Leftkowitz, Warren Mackenzie). Always worth the drive. 6. Rural America Contemporary Art group. An incredibly active Facebook group started by artist and Minnesota State University Mankato professor Brian Frink to network the activities of rural artists working primarily in Minnesota. 7. Works Progress: Colin Kloecker and Shanai Matteson drive Works Progress, an artist-led public design studio responsible for everything from the Give and Take lecture series and Salon Saloon (with Andy Sturdevant) to, most recently, A Public Thing. 8. Foundation funding: Every time I speak to visiting artists from other states I am reminded how fortunate we are as Minnesota artists for the financial support in the state. The generous contributions of foundations like the Jerome and McKnight foundations support both organizations and individual artists throughout the state. It isn’t like this everywhere. 9. The Legacy Amendment: Another unique accomplishment and symbol of the support for the arts within the state. 10. Galleries: Midway Contemporary, Franklin Artworks, SooVAC and the Soap Factory and many others consistently exhibiting new work by local, national and international artists. We are lucky to have a group of long-standing spaces in the community that have built reputations well beyond the state and also provide a venue to show artists. 11. Killer music scene. Vibrant as always. I could list dozens of musicians here … but I’ll save for another post. 12. Open Field: Shameless plug…but I am very proud and thankful for it. 14. Art Hounds: Something to look forward to on Minnesota Public Radio each and every week. It’s nice to have a format to just be a fan of others work and not a marketing plug. 15. All my friends and colleagues: My incredible colleagues at the Walker and my mnartists.org team of Susannah Schouweiler, Jehra Patrick and Katie Hill. I feel fortunate to work with such talented, inspiring and fun people everyday. And to all my artist friends for keeping me motivated, challenged and hungry. 16. Art Shanty Projects: They are back! 17. Silverwood Park: Part of the Three Rivers Park System, Silverwood is an arts focused city park and one of the best kept secrets in the city. If you haven’t been there yet .. you need to go. 18. Northern Spark: One of the best reasons to stay up all night since I was thirteen….and mark your calendar for June 9–10 for its return. 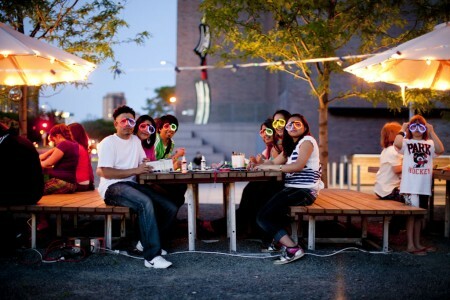 We have big plan … think Smore Bar and more glow sticks. 19. Springboard for the Arts: Unrivaled resource for artists throughout the state co-creator of the very popular CSAart program with mnartists. 20. Theater, dance, film and all the other cultural opportunities I do not take part in enough. Even though I don’t attend that often, I am so glad you are here. 21. Social media: The adoption of social media by the art community has created an amazing vehicle for exchanging ideas, event promotion, debate, trouble shooting, resourcing and praise. I don’t know how I would do my job without it anymore. 22.CraftersLocal 612 and No Coast Craft-o-rama: Yay for the craft scene! The No Coast Craft-o-Rama is a craft event that began in December 2005 as a way to feature a variety of designers, artists, crafters and other talented creators of unique handmade goods. It’s coming up in 2011 on Friday, December 2 (3 p.m. to 8 p.m.) and Saturday, December 3 (9 a.m. to 5 p.m.) at the Midtown Global Exchange building. 23. MAEP: The longstanding is Minnesota Artist Exhibition Program is unique in both its organization and the opportunity it presents for Minnesota Artists. 24. Forecast Public Art: Another national arts leader in our backyard. 25. The weather: Seriously, without the weather keeping us inside for nine months of the year I doubt we would have so many amazing musicians, artists and writers….seriously. 26: Personal opportunities to work with and learn from the older generation of artists such as Judy Onofrio and Warren MacKenzie. I feel uniquely blessed to have had the opportunity to work with each of them on exhibitions in the past and to recognize their ongoing influence on younger generations of artists. 27: New galleries and projects like Tarnish and Gold, XY&Z, Faux Poco, They wont find us here, and Hopsack Painting Co.
28. A well-rounded community featuring a robust array of cultural and sporting events. No, I don’t want arts funding redirected for football stadiums, but art and sports can get along and we need them both. 29. I am thankful to have a job where I can serve other artists and the art community. I hope that I can do a small bit to make this a better place to live and work. I am also thankful that I have a job that includes drawing with artists on summer afternoons, finding sheep, concerts in parking garages, making lawnmower musical instruments and campfire concerts. 30. And last … but should be first on the list … my incredibly kind, tolerant and patient wife and family. I couldn’t do any of the things I do without your assistance and support.